You really should book or pre book a private Taxi from Nice Airport to Cannes Palais des Festivals to have a flat rate for your airport transfer. 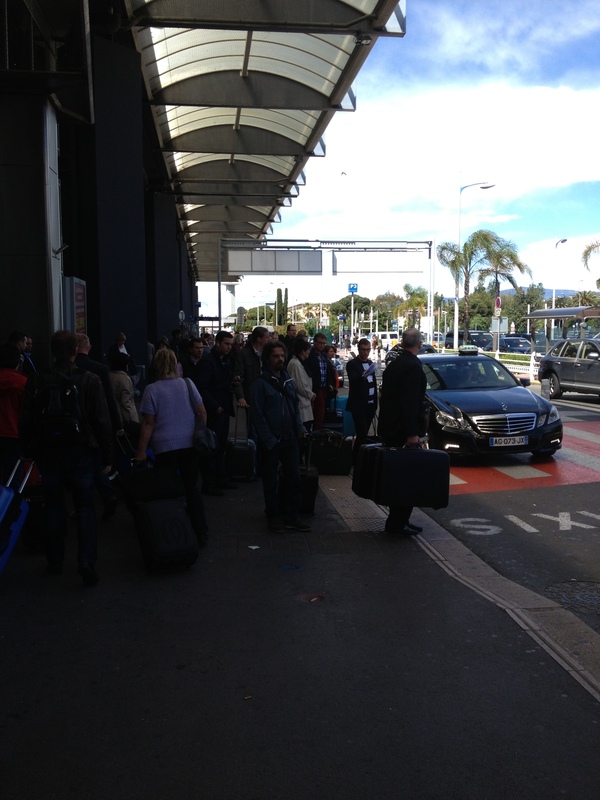 Look at the photo taken during Cannes Film Festival at Nice Airport Taxi station, for one hour there was no Taxis available ! During Festivals in Cannes, think there is a lot of people coming anf the traffic is high so the taxi fare for Cannes to Nice will cost a lot. Ask us : How much does it cost Taxi from Nice Airport to Cannes? Nice Airport Transfer Quote informs you of the necessity to book in advance your private Taxi or Van Minibus from Nice Airport to Cannes in order to have the best service and the best price for your taxi fare. Every year specially when you go back to Nice Airport from Cannes, you can wait for the Cannes Taxi Service for more than 1 hour. Booking with us is 100% satisfaction and the insurance to be on time for your departure at Nice Airport.